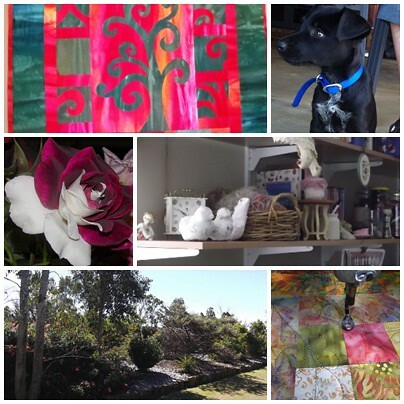 My name is Karen Mundt, and I operate my quilting business in Gatton, Queensland. I have been operating a long-arm quilting business for about 5 years, but have recently decided to take a break from that. I would like to spend more time working on my own quilts and hand-stitching, so while I still have a part-time day-job I should be able to free up some time. I am married with 3 children- but only the youngest one is still at home, sort-of. Luckily, they are all used to finding Mum in her quilting room. We live in a beautiful area of South East Queensland, in a nearly new house and a garden looked after by my husband, including the rose gardens he planted just for me! We have two dogs, one is Chloe the ‘old lady’, and kelpie-collie cross Hayley who likes to keep the old lady on her toes. I love exploring all types of patchwork, quilting and stitching but tend to favour raw-edge, naive and slightly rustic works with sometimes lots of colour, sometimes a faded well-worn vintage look. Your quilting, and your blog, looks great! I’ve linked mine to your tutorial on using vliesofix today… I hope my readers spend some time on your site. Congratulations Karen. I’m sure you will have many quilting experiences to tell us about on Tuesdays. Good on you for having a go,quilting looks great, I’ll have to sew some large tops so you can quilt them. Such a little cutie is hayley! Does this mean my foot is famous too? Photos on your quilts page look really good! Congrats! Your site looks great, can’t wait to see some more photos of your stuff in progress !!! !